He went to his Shaykh—Shaykh of Islam ibn Taymiyyah—because he wanted to speak to him about something, or to take knowledge from him. So he found him siting remembering Allah. He was too afraid to speak to him until he finished from the remembrance of Allah. Then he turned to him and said: How long have you been here? He said: Since such and such a time and I am waiting. Thus the Shaykh (Ibn Taymiyyah) may Allah have mercy upon him said: ‘This is my breakfast, if I do not take my breakfast, I would not have strength to work that day’. Thus his portion of remembrance was his breakfast which gave him strength to deal with work during his day; may Allah have mercy upon him. And this is how the Muslim is. ‘Verily to Allah belongs a paradise in this world, whoever does not enter it, will not enter the paradise of the next life’. Meaning the remembrance of Allah سبحانه وتعالى, it is paradise in this world because it relaxes the Muslim and soothes him and expands his chest, and removes his anxiety and repels the devils away from him. Thus it is a paradise. He enjoys it more than he enjoys food, drink, and desires. For this reason, you will find if a person does not say his portion of remembrance during the first part of the day or the first part of the morning, or the first part of the evening, you find him dejected and disconsolate. But if he adheres to his portion of remembrance in the beginning of the morning or the first part of the evening, you find him at ease with his chest expanded. 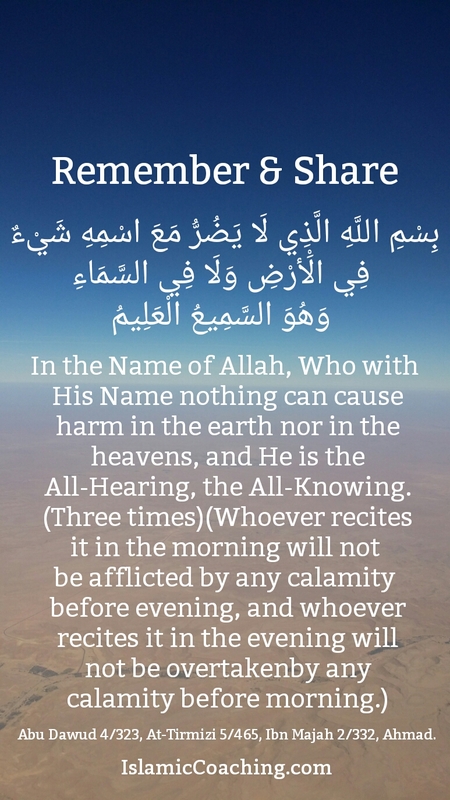 For this reason, the remembrance of Allah always and forever accompanies the Muslim; in the morning, in the evening, at the time of sleep, when he is aroused during the night or while sleeping, and when he awakens. The remembrance of Allah is always upon the heart and tongue of the Muslim. He is never able to do without it. They are not put at ease by the remembrance of Allah; they are only put at ease by the remembrance of the devil. We ask Allah for safety and security. I am with My slave, if he mentions me to himself I mention him to Myself, and if he mentions Me in a gathering I mention him in a gathering better than his gathering. Meaning: a gathering of Angels. Thus how can the person do without the remembrance of Allah, that which brings him near to Allah, and grants him the favor of Allah mentioning him and lauding him in the highest gathering?! These are tremendous benefits from the remembrance of Allah عز وجل. This is what protects him from his enemies, from the devils of man and jinn; thus it is necessary for the Muslim to adhere to the remembrance of Allah with his tongue, his heart, and his actions.